RND 1: Ch 6, join with sl st to form a ring. Ch 4, * (dc, ch 1) in ring. Rep from * 10 more times. Join with sl st in 3rd ch of beg ch 4. RND 2: Turn, sl st in next ch 1 sp. Ch 4, (dc, ch 1, dc) in same sp. * Sk next ch 1 sp, ( dc, ch 1, dc, ch 1, dc ) in next ch 1 sp. Rep from * around. Sk last 2 dc, join with sl st in 3rd ch of beg ch 4. RND 3: Turn, sl st in next dc, sl st in next ch 1 sp. Ch 3, dc in same sp, 2 dc in next dc, 2 dc in next ch 1 sp. Ch 2. * Sk next 2 dc, 2 dc in next ch 1 sp, 2 dc in next dc, 2 dc in next ch 1 sp. Ch 2. Rep from * around. Sk last 2 dc, join with sl st in top of beg ch 3. RND 4: Do not turn. Ch 3, dc in next dc, 2 dc in each of next 2 dc, dc in each of next 2dc, ch 4. * Sk next ch 2 sp, dc in each of next 2 dc, 2 dc in each of next 2 dc, dc in each of next 2 dc. Ch 4. Rep from * around, join with sl st in top of beg ch 3. RND 5: Ch 3, dc in each of next 7 dc. * (3dc, ch 2, 3dc) in next ch 4 sp. Dc in each of next 8 dc. Rep from * around to last ch 4 sp. (3 dc, ch 2, 3 dc) in that ch 4 sp. Join with sl st in top of beg ch 3. 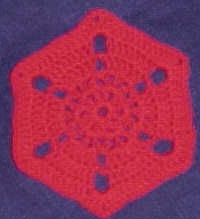 NOTE: You can use thread and a steel hook to make coasters with this pattern.